When I first started sewing for Gene I would check out fashion history books from the library. I fell in love with the dress on the cover of this book. Like many of my outfits, I originally made a doll size version of this black sheath many years ago. This was my first attempt back in 2004. 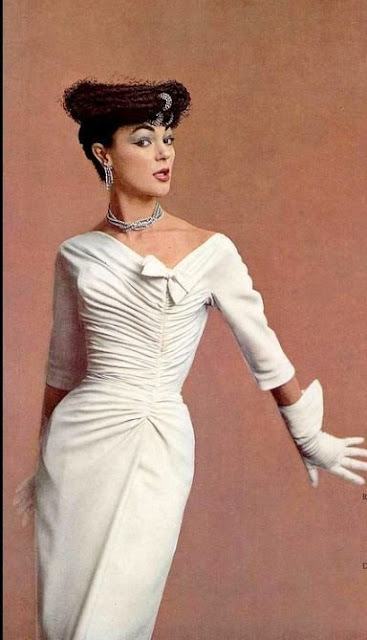 The dress opened in the front and was made of synthetic crepe. I made a pink pillbox hat and covered the front of the hat with flowers. Years later, I found some more pictures of this sheath on the internet and I decided I would try to make a better version of it. I scoured the internet for more information about this ensemble. 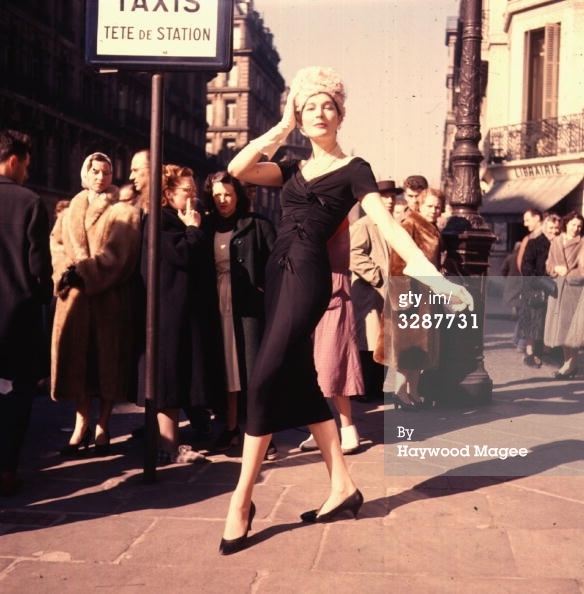 I never found out who the designer was, but the ensemble was modeled by Bronwen Pugh for Paris Fashion Week in 1957. I think my second attempt turned out a lot better than the first one did. I lightened the next two photos to show the details better. Details are often hard to see on a black garment. This dress opens in the back which keeps the front from looking too bulky. The bows are made of silk embroidery ribbon. I'm not sure what the original dress is made out of. It may be a silk jersey. Since silk jersey is very expensive and I was too chicken to try to make this dress in that fabric. I made it out of a black silk georgette, underlined in black lining fabric and lined in white. Figuring out how to recreate the hat was a real challenge for me. This hat covered the model's whole head, but most of the Gene dolls don't have hairdos that work well under this kind of hat. 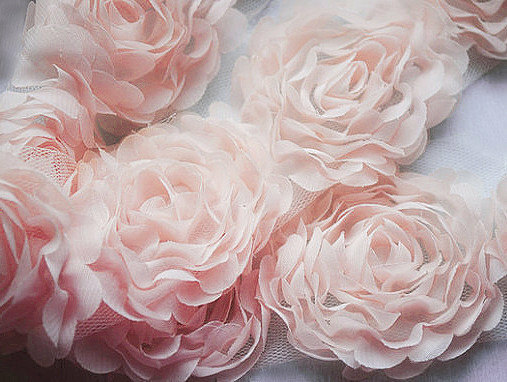 I got the idea of using chiffon flower trim for the hat from another doll designer. She has the most adorable doll clothes! It still took me many attempts to figure out how I wanted to make the hat. First I made the hats fit over a bald JAMIEshow head, but I decided that made the hat look more like a weird pink wig instead of a hat. Then I made a hat that would fit over a JAMIEshow wig cap, but I didn't like the lumpy look in the back. These hats were very time consuming to make and were sewn while on the doll, which risked messing up her hair and eyelashes. I finally decided to make a hat that would have the look of the original hat in the front, but leave the hair in the back uncovered. These hats are a lot easier and faster to make. It fits IT's "Star Entrance" very well. It also doesn't mess her hair up while putting it on and taking it off. Of course I wasn't satisfied with just making a little black dress. I decided to also make a little white dress! I found this picture on The Studio Commissary a few years ago. 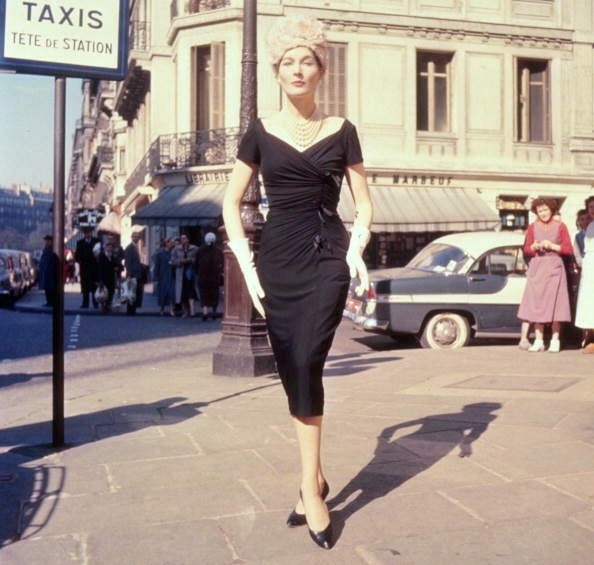 I have no idea who designed this dress or when it was made, but I thought it had a lot in common with the black dress. It doesn't have as many gathers as the inspiration dress, but that probably has to do with the small size of the dress. You know, human scale verses doll scale. I made this dress out of a soft white silk georgette, and this dress was easier to make than the black dress. My mother had that hat in the 60's. It was a bucket hat covered with pink cabbage roses. 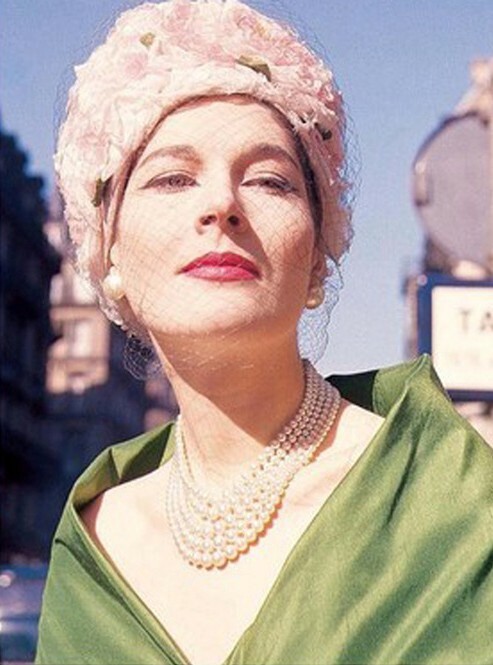 Picture an oversized pillbox that sits high on the head. I remember trying to pull the roses off of it in church! I was very happy when she finally threw the hat away in the 70's before me moved to FL.